Put your display to sleep by Global Hotkey or an optional Menu bar icon. Is there a better alternative to DisplaySleepr? Is DisplaySleepr really the best app in Desktop category? Will DisplaySleepr work good on macOS 10.13.4? 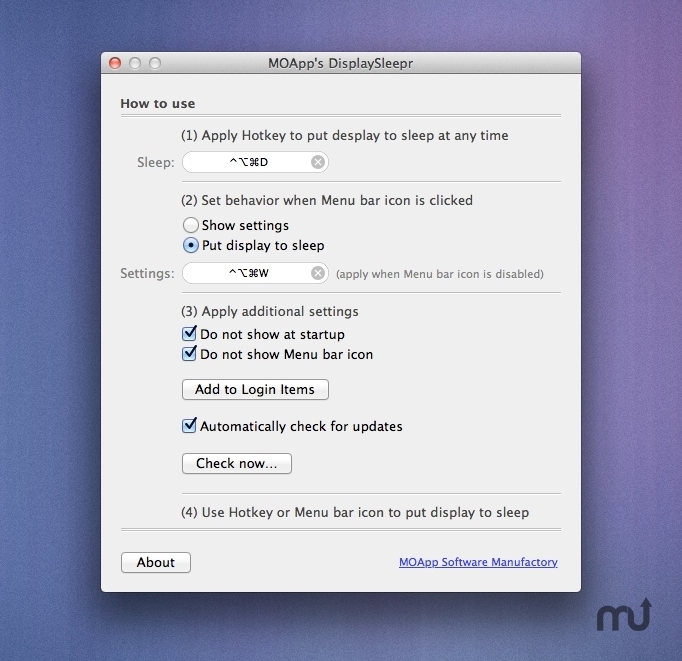 DisplaySleepr puts your display to sleep by Global Hotkey or an optional Menu bar icon. This makes much sense of you normally don't put your Display to sleep and want to save energy when an Apple TV is attached or just need to do something else for some minutes or whatever . but, if your'e working with an Apple Cinema Display, an iMac or need your Hot Corners for everything else than putting your display to sleep - this little tool may be something for you. DisplaySleepr needs a rating. Be the first to rate this app and get the discussion started!